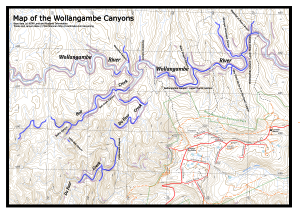 From this page you can download high quality maps of canyon areas around Sydney for printing. 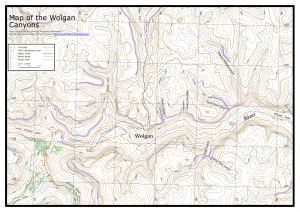 These tracks on these maps are in general more accurate than the LPI maps or web site. 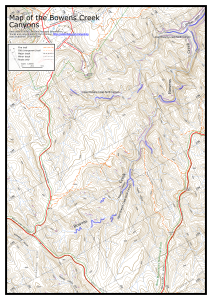 That said, tracks are ephemeral, so use these maps at your own risk. 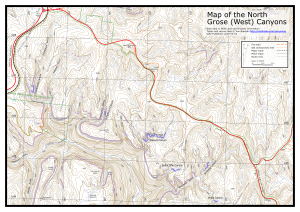 In particular, in wilderness areas, fire trails are typically being allowed to revegetate, so the condition of some fire trails may be overgrown. 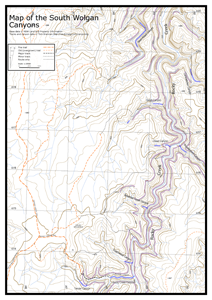 Also, note that only relatively well-known canyons are marked on the maps. 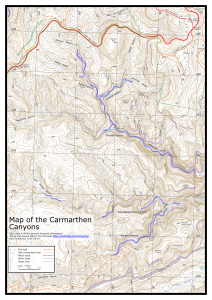 There are other canyons not marked on the maps. See my comments on publishing track notes for why this is the case. 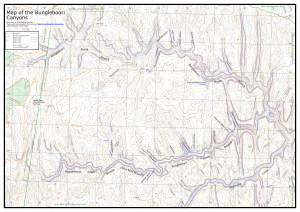 There are some places where the Lands Dept hydrography data is more recent, and not in sync with their contour data. 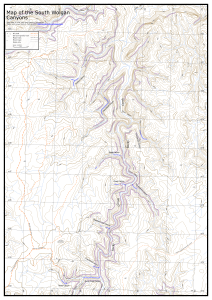 As a result, there is some misalignment of canyons, creeks and contours. I have left many of these inaccuracies for now, and will reproduce the map more accurately if they subsequently update their contour data. 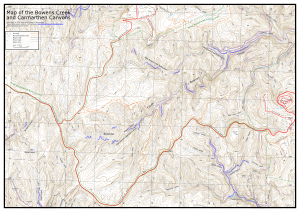 Generally speaking, the canyons are most accurate, followed by creeks, and contours are least accurate. 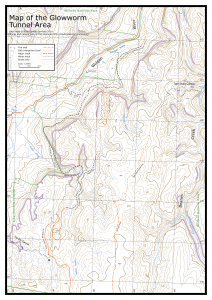 The maps should print out at 1:25000 scale on an A4 page (or A3 where specified), with no resizing. You may need to override settings in your PDF viewer to enable this (it will probably want to print it slightly smaller). You'll also need a fully fledged PDF viewer - for example, the one built in to the Firefox browser doesn't really cut it! In Adobe Reader, appropriate settings are "Actual Size" and "Choose paper source by PDF size". 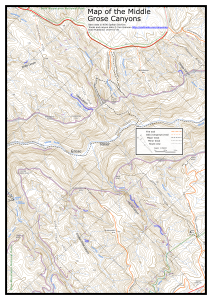 The maps are in vector format, so they should be able to be printed out at whatever resolution your printer supports (600dpi+). Any errors in the tracks, fire trails or canyons, feel free to let me know - contact details below. The other data is NSW Spatial Services data.